What is a Switch Interface? Any device that allows people to control a computer or games console using separate disability standard plug-in switches (see picture above). 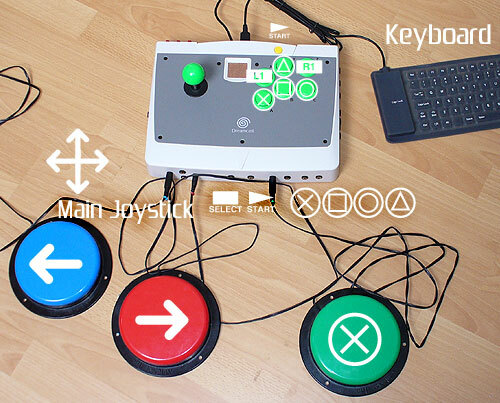 Disabled people can then play many games using a variety of body movements, or even eye-blinks, where a traditional controller might be too difficult. Switch Interfaces are also known to some as adaptive, accessible or enabling technology. As with all game controllers, one does not fit all, so you will need the right switch interface, and possibly an extra adapter to match up to your games machine. Accessible game controllers: List of enabling technology to buy. Do It Yourself guides: adapt your own game controllers. AbilityNet GATE: guide to switch systems. What's a 'disability standard' switch? A disability standard switch can range from a large separate push button on/off switch that can be operated by broad movements of the body, to an eye-blink switch that sits over a pair of glasses. The standard part is that they should be able to plug into specially made or adapted equipment via a 3.5mm headphone style socket. What do I need to play games with switches? A games console or personal computer. A switch interface controller connected to your games machine. The right playing set-up is often only discovered using a mix of personal research and trial and error. However, if I can help, I will. Finding enjoyable and playable games is also a case of trial and error, as for anyone. Modern games are expensive, so try borrowing or hiring games first, or check your retailer's returns policy. Alternatively there's a wealth of cheap second hand games out there from eBay, boot sales and from retro traders. How can I improve my switch skills? Don't aim to high to start with, but equally, don't get bored with the same challenges. Take a look at Chris Addis's Using Switches and Switching Systems booklet, and Inclusive Technology's Switch Progression Road Map booklet for more ideas. See also the excellent SENICT and Linda Buckhart resources.